A loom is a device used to weave cloth and fabric. The main purpose of a loom is to hold the warp sheds under tension to allow the interweaving of weft yarns. This is the basic function of looms. Looms vary greatly in terms of mechanism and operation, but the underlying principle is the same. The three main types of looms available in India are Jacquard looms, Rapier looms and Airjet looms. This article enlists the mechanism and the benefits and drawbacks of Rapier and Air-jet looms, allowing you to make your choice efficiently. The weft insertion systems of a Rapier loom is one of its biggest advantages. It is a shuttle-less weaving loom in which the filing yarn is carried through the shed of warp yarns to the other side. Small finger shaped carriers called rapiers are used to accomplish this. A rapier carries the weft yarn across the fabric to the other side and then retracts, leaving the new filling in its desired location. Rapier looms are commonly classified as single rapier or double rapier. The advantage of the latter is that only 50% of the rapier motion is utilised in the weft insertion as compared to a single rapier system. Rapier looms are also divided into rigid and flexible systems. Flexible systems have a wide application range and increased adaptability and a width of ~460cm. Ø A rapier loom is very versatile. A wide range of fabrics can be woven in this loom. Ø Its operating speed is much higher than other shuttle looms. Ø High precision allowing easy weft patterning. Ø It consumes a moderate amount of power. Ø A double rapier loom takes a lot of space (as large as the cloth to be woven). Ø In a single rapier system, one movement of the rapiers is wasted. Ø It makes a lot of noise compared to water and air jet looms. Ø Production speed is lower than that of jet looms. You can buy high quality second-hand Rapier looms here at Vendaxo. A jet loom is a shuttleless type of loom which utilises fluids (water and air) at high speeds to act as the weft carrier. The relative velocity between the jet and weft thread creates a force which results in its insertion. The thread is then carried through the warp shed. These machines can either use compressed air from an in built compressor or an external compressor in the weaving room. Additionally, the pressure of the air can be controlled. Ø Since air jet looms allow high quality production at low costs, they are used for the economic production of standard fabrics. Ø It has an exceptionally high insertion rate making it faster than rapier looms. Ø They have a low initial cost and maintenance because of fewer moving parts and simple mechanism. Ø Heavier yarns are more suited to air-jet looms than lighter yarns. Ø The energy used to prepare the compressed air is high. With faster production speed, more energy is consumed. Ø Not as versatile as rapier looms. Ø Better for mass production than specialty/fancy fabric. 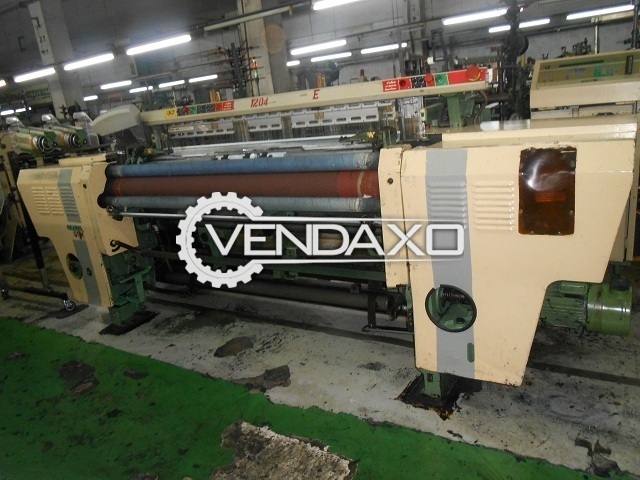 You can purchase used air-jet looms at affordable prices on Vendaxo.com. Depending on the type and quantity of the fabric required, you can select an air jet or rapier loom. 4 SIMPLE STEPS TO IMPORT USED INDUSTRIAL EQUIPMENT INTO INDIA. HOW TO DETERMINE RIGHT VALUE OF USED MACHINERY? BEST WAYS TO FIND AN APPROPRIATE MARKETPLACE FOR SELLING USED MACHINERY?